Logiforms provides an inventory control feature to track the number of items remaining in inventory, and deduct one or more items inventory with each form submission. You can set up multiple inventory controls and use rules to determine if a submission should deduct inventory from one group or another. Common uses for the inventory control feature include selling tickets to an event, or limiting the number of times a form can be submitted before it is taken offline. You can configure actions that will happen once inventory is depleted. You can take the form offline, hide/show fields or field options and more. You will also need to know about Managing Inventory Controls. 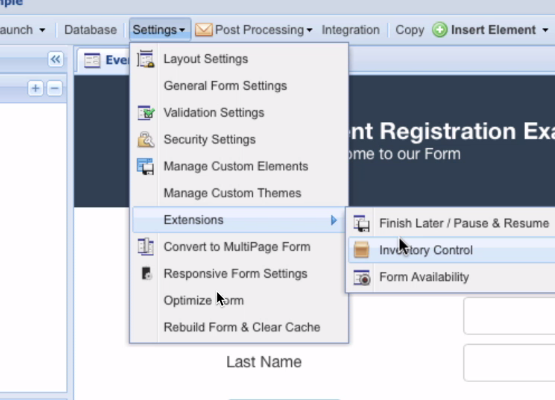 From the Form Designer Toolbar choose Settings > Extensions > Inventory Control. To add an inventory control profile, click New in the toolbar. The Inventory Control Settings windows appears. Enter a Name for the inventory control. The name is shown to the end user when inventory is not available and a submission is made, so choose something meaningful. Specify the Total Initial Available Inventory. In the Update Quantity field, enter the number that will deduct from Available inventory for each submission. You can enter a numeric value, or click the wild card icon to select a value from your form that contains the number to deduct. Often, you will have a quantity field on your form, and you will want to use that field value here as the number to deduct. Edit the Conflict Error Message. This message will display to one of two end users when two conflicting submission are sent at the same time. The message should indicate that inventory is actually no longer available, due to high volume processing. This is unlikely to occur, except perhaps on very busy forms where two users are competing for the very last inventory item. Under Inventory Control Rule you can create a rule that must be matched in order for the inventory to be deducted. If you have multiple Inventory Control Items, you will likely need to create rules to determine when an Inventory Control Rule should be "executed" and inventory reduced. When no rule is specified, all submissions will cause inventory to be reduced by the amount you specify in Update Quantity in the previous step. On this screen you choose which action to take when you run out of inventory for this item. Choose one of the four options which are described in more detail below, and click Next. On the Notification Setting window, indicate if you want to receive email alerts about low inventory and depleted inventory. Check the Enabled box if you want to receive low inventory notifications. Six fields appear. In the Notification Threshold field, enter the inventory level at which you want to be notified. In Recipient Email field, enter the email address that the notification should go to. In the From Address and From Name fields, enter the name and email address that the notification should come from. In the Email Subject field, enter the subject line of the message. Click Launch Editor to write the notification message. Click Save. In the last step of the wizard, you have the option of configuring a Commit Rule. A commit rule is typically used in conjunction with a payment processing profile and defines if the inventory should be committed. When the rule matches, the inventory is reduced. If there is no rule match, then the pre-authorized inventory is released. For example, if you were processing a payment with Authorize.net, you would check the result from authorize.net for the approval flag in order to commit the inventory. This setting is optional and should only be used with a 3rd Party Integration action. Click Finish to complete the Inventory Control wizard . This option for Inventory Depletion displays a message or redirects to another web page when inventory is depleted. The form will not display. In the Mode field choose either 'Inline Message' or 'Redirect URL'. If you choose Redirect URL, a field appears where you enter a URL that the user will be directed to when the forms inventory is depleted. This is the simplest implementation and most commonly used. Keep in mind that it only supports one inventory item since after an item is depleted the form is take offline. If you have multiple Inventory Control Items, you should consider other options. Click Next to move to the Notification step of the wizard. This option will hide the selected fields on your form when the inventory is depleted. You can hide one or more fields. A typical use would be to hide the registration information for a particular seminar after all the seats are assigned. Select one or more fields to hide. Use Shift + Click to select contiguous fields or CTRL + Click to select non-contiguous fields. The Hide Field Option will hide specific options of a multi-choice field like checkbox or radio button. This is typically used in conjunction with multiple inventory control rules. For example, you might have the option to register for three different seminars on your form. Each seminar is represented by an option in a checkbox group. When one seminar is full, you can hide that specific option of the checkbox group so that that specific seminar can no longer be selected. In the Options to Hide list select what you want to hide. You can use Ctrl+Click to select multiple options. In addition to selecting the field option(s) to hide, you can also control what happens when that field has no options left -- for example all seminars are full. Choose between hiding one or more fields or setting default values. If you click Select Fields to HIde, use Ctrl+Click to select one or more fields to hide when no optons are left. Then click Save. If you choose to set new default falues, click Edit Default Value Settings. This action will populate the fields on your form with specific values once inventory is completed. This is typically used in conjunction with Dependencies to provide a reference that the inventory is depleted. For example, you may have a hidden field on your form called inventoryIsEmpty and set that to true when inventory is depleted. Dependencies (or conditional branching logic on a multiple-page form) can then reference this field to hide/show other fields and control other logic. Click Add New Field Row in the toolbar to add a new row, and then select the field on the left column and enter the new value in the right column. Then click Save. This feature can be used with dependencies to hide/show other fields and also change branching and other options. Click Add New Field row in the toolbar to add a new row. In the left hand column, select the field to edit. On the right hand side, enter the new value. To test any Inventory Control changes, you must first save the changes made to the form, and then Launch a Live Form. After taking actions on the form that affect inventory, click the Submit button and close the live form. Then Save again and launch the Inventory Control Manager to see inventory status for each inventory control.